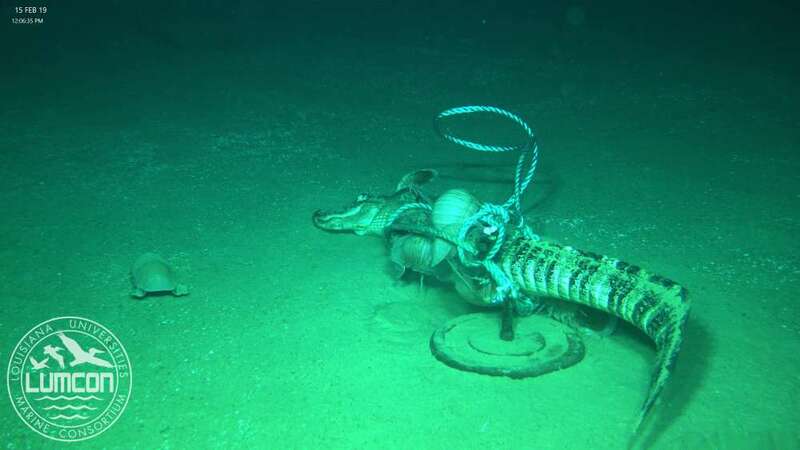 Ever wondered what would happen to a hog-tied alligator dropped to the ocean floor 2,000 meters (6,500 feet) below the sea surface? Yeah, neither have we. But that’s exactly why we’re not researchers with the Louisiana Universities Marine Consortium (LUMCON). In February, two LUMCON scientists deployed two alligators to the bottom of the Gulf of Mexico in order to document how organic materials created on land – like reptiles – might sustain and impact ocean food webs, including those that once contained now-extinct reptiles that lived in ancient oceans. Let’s just say the video is… appetizing? I mean, what depth-dwelling isopod wouldn’t want to be served an alligator à la carte? River Dixon, a PhD student at the University of Louisiana at Lafayette who worked on the project, says that the deep-sea alligators provide more than just an entertaining show. It’s an opportunity to study how the amount of food available to a community can change the way the animals in that community interact, both in terms of who is there and who is eating whom. Specifically, the researchers can observe how carbon from the land makes its way to the sea and what that means for marine ecosystems. Dixon and her team received a permit to use three exterminated alligators that had been deemed to be a nuisance. 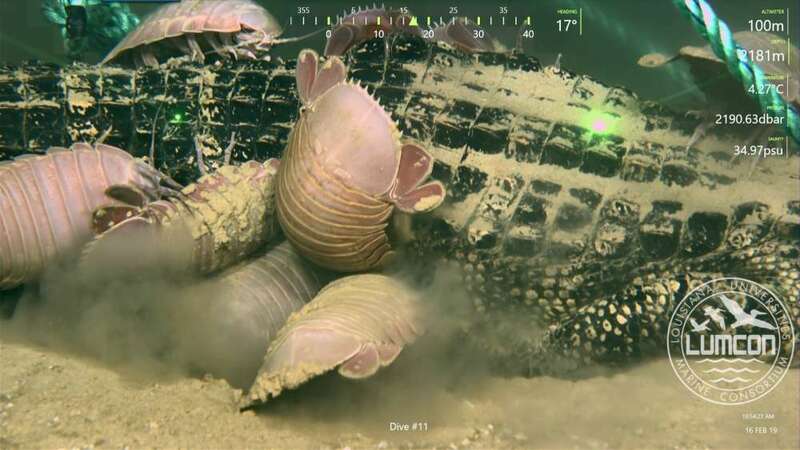 After less than 24 hours, the alligators were swarmed by deep-sea organisms called isopods, notorious scavengers known for responding to food very quickly. Over the next few years, researchers hope their alligator falls will lend more information to two things. First, Dixon notes that her team hopes to see what – or if – there are any deep-sea creatures remaining that may have once thrived on the alligators’ ancient relatives. Specifically, large marine reptiles such as plesiosaurus or ichthyosaurs. 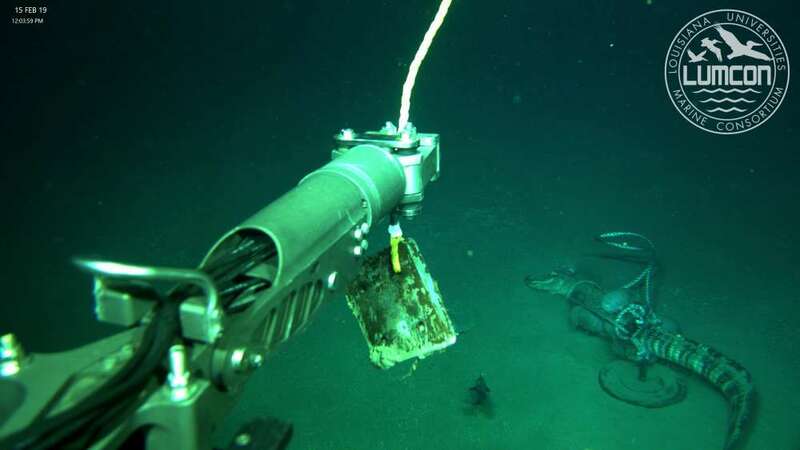 Second, the researchers hope to fill in missing information about how the deep-sea food web works by tracing the transfer of land-based carbon through marine organisms that have eaten terrestrial ones. 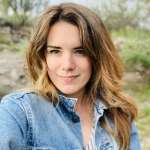 Dixon says her team hopes to study carbon transfer up through the food web by collecting marine organisms such as bone worms (Osedax), which live off the bones of sunken dead animals.